This 30ml decorative flask contains special pure olive oil from the holy land scented with fragrances that conjure up the beauty and purity of Jerusalem. This particular flask is termed "Ruth", after the Biblical personality of Ruth who sought to shelter under the divine presence. The perfumed flask is hand painted and undergoes traditional manual antiquing and oven firing to achieve the special tints of ancient glass. Anointing oil is used for the purpose of taking on special status before God. Thus oil is throughout the Holy Bible to anoint kings and princes, to consecrate the holy temple and to heal the sick. But the anointing, which you have received from Him abides in you 1 John 2:27. In today's modern word, where we are so rushed to live our daily lives, there is a great need to strengthen our faith by any means possible. 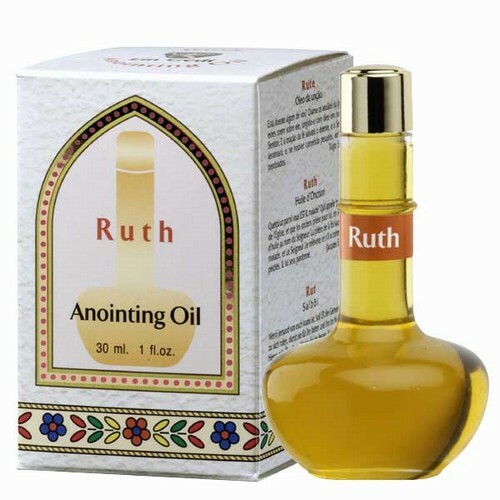 Many have the custom to use anointing oil for this purpose, specifically for providing fortitude to those who are ill and to speed their way to recovery.